The result is freaking awesome, I must say! 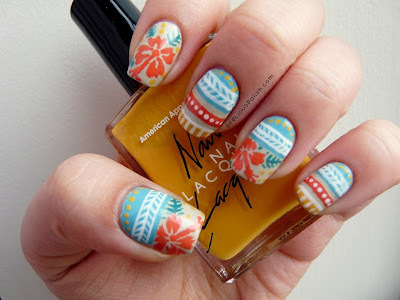 The flowers contrast with the tribal, and I love it VERY MUCH, ha! argh don't make me think of summer, it's snowing right now! That's so adorable and summery! This is so beautiful, I love the hibiscus flowers you did! These are gorgeous! I love your hibiscus flowers! Girl, these are ay-MAZING! The design itself is fabulous--I love the combination of the geometric and the flowery--and you did a spectacular job with it. And I'm totally crushing on the colours!